Photographs are considered as copyrighted items. So if you work with a model you need to sign a contract for saving the rights of both sides. 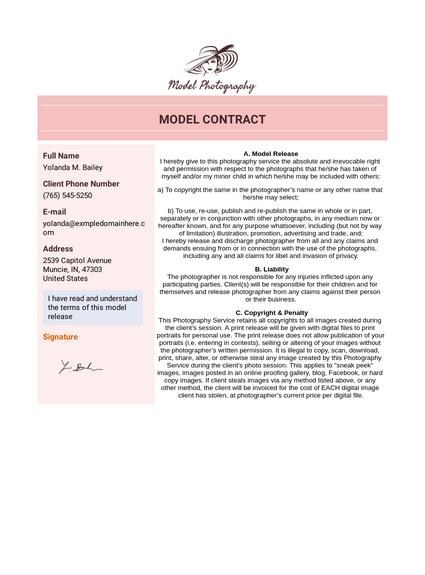 With this online model contract PDF template, it's easier to give the rights of your image upon a photo-shoot. This model consent template includes personal information of clients and a sample contract with signature field. Our model contract PDF template is prepared by simplified for you so you can only see the most important information like model full name, address, phone number, email address, contact context that contains release, liability, copyright & penalty article samples. With our PDF editor, you can also change the whole design if you need to. This Photography Service retains all copyrights to all images created during the client’s session. A print release will be given with digital files to print portraits for personal use. The print release does not allow publication of your portraits (i.e. entering in contests), selling or altering of your images without the photographer’s written permission. It is illegal to copy, scan, download, print, share, alter, or otherwise steal any image created by this Photography Service during the client’s photo session. This applies to "sneak peek" images, images posted in an online proofing gallery, blog, Facebook, or hard copy images. If client steals images via any method listed above, or any other method, the client will be invoiced for the cost of EACH digital image client has stolen, at photographer’s current price per digital file.